How to become So Interesting that Bravo Gives You Your Own Reality Show ~ HELLO, my name is Blog! Remember the scene from Planes, Trains and Automobiles when Steve Martin reaches his breaking point? “Didn't you notice on the plane when you started talking, eventually I started reading the vomit bag? Didn't that give you some sort of clue, like maybe this guy is not enjoying it? You know, Del, not everything is an anecdote. You have to discriminate. You choose things are funny or mildly amusing. You're a miracle! Your stories have NONE of that! They're not even amusing accidentally. Oh, and when you're telling these little stories, here's a good idea: Have a point! It makes it makes it so much more interesting for the listener. I could tolerate any insurance seminar. For days I could sit there and listen to them go on and on with a big smile on my face. 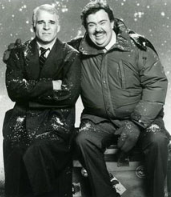 They’d say, ‘How can you stand it?’ I’d say, ‘Because I’ve been with Del Griffith. I can take ANYTHING.’ And you know what they’d say? They’d say, "I know what you mean: The shower curtain ring guy. Whoa." You’re more interesting than that, right? Because there’s a direct correlation between how boring you are and how successful you become. How much time are YOU spending becoming more interesting? Your job is twofold: First, to divert. People’s eyes, ears, attentions and minds. SECOND, to cause to muse. So people stop fixedly and begin to ponder. How amusing are you? 2. Choreograph attention. One of my favorite slides to present during a speech is the word “But…” in huge letters. It silences the audience. It directs their attention. And it makes them eagerly anticipate whatever I’m going to say next. Sometimes I don’t even know what I’m going to say next. But it doesn’t matter. Because the attention of the audience has been choreographed. How are you taking people exactly where you want them to go? Your challenge is to become the type of person that, when people meet you, they say, “Wow, I have so many questions…” How do you elicit curiosity? 4. Being fascinating means that moment-to-moment, people want to see what happens next. That’s one of the reasons wearing a nametag 24-7 is so interesting to people – it’s unpredictable. You never know what type of encounter or interaction will ensue next. As Made to Stick taught us, “Ideas endure if they generate interest AND curiosity. Surprise is not enough. Surprise ATTRACTS customers’ attention, but interest KEEPS their attention.” How could you keep your audience on the edge of their seats? Ultimately, interest occurs at the moment of relevance. Not relevant = Not interesting. Are you making the effort to demonstrate relevance when it would otherwise slip by? 6. Interest can be stimulated by seeking alternatives and by offering a limited number of choices. “In a way, an offered choice is an attention-directing device. Instead of just asking someone to ‘think’ in general, you provide the specific framework for the thinking,” Debono said. For example, my friend Jeff has one of the best voicemails I’ve ever heard. It goes like this: “Hey it’s Jeff and thanks for calling! I’d like you to do three things for me: First: Leave the best way for me to get back to you. Two: Share your biggest marketing challenge. And three: Tell me how, specifically, my company can help you the most. Talk to ya soon!” What attention-direction advice could you leverage on your voicemail or auto-responder? 7. Interest is a function of abnormality. A nametag worn in unusual situations – at beach, for example – breaks people’s patterns. It creates a mental pause. It violates people’s schemas. And that’s exactly why they notice it: Because the most basic way to get someone’s attention is to break their pattern. What patterns could YOU break? 8. Questions direct attention. Debono also mentioned, “It is what happens in the listener’s mind that makes him interested.” That’s why questions are your secret to boosting your interestingness. Because they’re not questions – they’re catapults. Setups. Provocations. That’s how I approach everything I write/speak/coach about. By thinking about the most relevant, challenging and disturbing questions I could ask. Of course, it helps that I have a database of 7000+ questions on standby at all times. How memorable are YOUR questions? 9. The main source of interest is expectation. “There is a setup with a clear expectation,” says Debono. “And interest can be engineered when you’re setting things up.” Take Vocal Hangars, for example. I use them in my writing, videos, presentations and conversations. These conversational bookmarks (i.e., “Let me ask ya this…”) attract people’s attention by building excitement around what you’re going to say next. This heightens the level of anticipation and energy into the conversation. How do you elicit rapt interest? 10. The process of opening things up is the key to being interesting.Finally, Eddy D argues that being dogmatic and always narrowing everything down to certainty is boring. I couldn’t agree more. The blandness of terminal certainty alienates people faster than an atheist at a Billy Graham revival. How’s your mental flexibility? REMEMBER: If you want to maximize the noticeability and spreadability of your idea, you need to create a widening circle of interest around it. And when the pilot of your reality show airs on Bravo, let me know - I'll set my Tivo. Oh, wait. I forgot: I just cancelled my cable. Nevermind. Guess we're watching it at your house! For the list called, "30 Ways to become the Most Interesting Person You Know," send an email to me, you win the list for free!